The Helena-West Helena School District participated in the Back to School Bash sponsored by the Boys and Girls Club of Phillips County. HWHSD, along with other community supporters, provided school supplies for over 250 students in the community. The students also received a chance to sign-up for club membership. 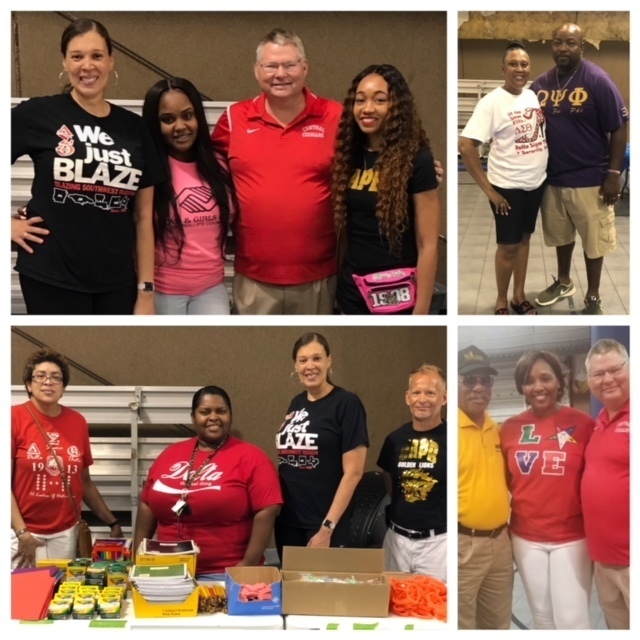 Pictured above are some of the many HWHSD employees who participated in this event: HWHSD School Board Members (President Andrew Bagley and Earnest Simpson, Jr.), Delta Sigma Theta Sorority, Inc.-Helena Alumnae Chapter (Brenda Brown, Durenia Hamilton, and Assistant Principal Priscilla McDaniel),Boys and Girls Club Staff Member (Carlisa Scott), J.F. Wahl Parent Facilitator (Amanda S. Fears-Eaton), Omega Psi Phi Fraternity-Xi Rho Chapter (Athletic Director Russell Smith), Order of the Eastern Star (Vivian Eaton), and UAPB Alumnae (Ashia Mills and Jeff Dyer).